Coyle posted an update on his personal Twitter account Thursday, stating his back injury "will prevent me from returning to the field again." Analysis: Primarily a special teamer during his first three seasons, Coyle logged 57.4 percent of the defensive snaps in 2017 en route to a career-best 64 tackles in 16 games with the 49ers. The elevated role extended into Week 1 of last season, but he sustained a concussion and fractured vertebrae in that contest and missed the rest of the campaign. It's unclear which injury will force him to hang up the cleats, but Coyle is calling it a career. Coyle (back) was released with a failed physical designation, freelance NFL writer Howard Balzer reports. Analysis: Coyle was previously reported to be ready to return but his physical suggests he's still dealing with the back injury that sidelined him for 15 games in 2018. He'll have to return to health before he's able to catch on with another team for 2019. Coyle was released by the 49ers on Thursday. 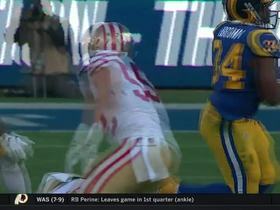 Analysis: Coyle played a large role for the 49ers in 2017 but played only a single game in 2018 due to a broken bone in his back. The linebacker is reportedly ready to go for 2019 and could catch on with another club as a backup linebacker. Coyle (back) played in only one game this season but is good to go for 2019. Analysis: Coyle landed on injured reserve after Week 1 due to a concussion and a fractured vertebrae. The 28-year-old started Week 1 but is more likely to serve in a rotational role. Coyle suffered a broken bone in his back in addition to a concussion, Nick Wagoner of ESPN.com reports. Analysis: Coyle was placed on injured reserve Wednesday, meaning the linebacker will miss at least six weeks while he works to recover. He could be a candidate to return as the season progresses, but San Francisco won't make a definitive choice in the near future. Coyle (concussion) was placed on injured reserve Wednesday, Matt Maiocco of NBC Sports Bay Area reports. Analysis: Coyle suffered the concussion during Week 1's matchup against the Vikings, when he started in place of Malcolm Smith (hamstring). With Coyle relegated to IR, the 49ers will rely on Fred Warner as their starting middle linebacker versus the Lions on Sunday. Coyle suffered a concussion Sunday against the Vikings, Matt Barrows of The Athletic reports. Analysis: Coyle started in place of Malcolm Smith (hamstring) in the season opener. If the 27-year-old is able to clear the concussion protocol in time to suit up for Week 2's matchup against the Lions, he could once more play a key role in the 49ers' defense. Coyle will start Sunday against the Vikings, Matt Maiocco of NBC Sports Bay Area reports. Analysis: Coyle will replace Malcolm Smith, who is listed as doubtful with a hamstring injury. He'll be tasked with slowing down Vikings' running backs Dalvin Cook and Latavius Murray. The 27-year-old has plenty of experience, as he was a rotational linebacker for the 49ers in 2017, making 64 tackles in 16 games. Coyle (knee) recorded three total tackles in Saturday's preseason game against the Colts. Analysis: Coyle had been out or limited since the early portions of training camp with a knee injury, but given that he was able to play 29 snaps and provide decent production for the 49ers on defense, it appears the linebacker is back to 100 percent. Coyle (knee) was a limited participant in Monday's practice, David Lombardi of The Athletic Bay Area reports. Analysis: It was originally reported Sunday that Coyle would be held out of practice this week and also miss Thursday's preseason opener, but it looks like the linebacker could have a better outlook. Given that he was just a limited participant, it's still likely the 49ers hold Coyle out of Thursday's contest, but the fact that he is on the practice field suggests that he could be further along than originally thought. Coyle (knee) will not practice this week and has been ruled out for Thursday's preseason opener against the Cowboys, David Lombardi of The Athletic Bay Area reports. Analysis: It looks like the 49ers are just being cautious with Coyle, as they fully expect the linebacker to be back in action next week after a week of rest. Coyle is potentially in line to take on a starting role on defense to start the season with Reuben Foster serving a two-game suspension. Coyle (knee) is expected to be held out of team activities through the end of the week after experiencing tightness in his knee Tuesday, Matt Maiocco of NBC Sports Bay Area reports. Analysis: The timing of Coyle's knee injury is unfortunate, as he had recently made a full return to practice following offseason shoulder surgery to repair a torn labrum. The 49ers are simply describing the linebacker's knee injury as tightness, so it sounds like a major injury has been averted. When Coyle returns to action, he will be competing for a starting role to begin the season while Reuben Foster serves his two-game suspension. Coyle (shoulder) was a full participant in practice Friday for the first time this offseason, Matt Barrows of The Athletic reports. Analysis: Coyle had returned to practice in limited fashion earlier in the spring when he took part in some individual drills, but a return in full capacity Friday is a great sign for the linebacker with the start of the regular season still over a month away. The linebacker took reps with the first-team defense during practice, and Coyle is considered the leading candidate to replace Rueben Foster as a starter while the latter serves a two-game suspension to start the season. Coyle (shoulder) is one of the leading candidates to replace Reuben Foster while he serves his two-game suspension, 49ers.com's Joe Fann reports. Analysis: Coyle, Malcolm Smith and rookie Fred Warner were all mentioned as potential temporary replacements for Foster, but it makes sense that the two veterans would be the leading candidates to start at the Mike and Will linebacker positions, respectively. Coyle, who is coming off surgery on a torn labrum, posted a career-high 64 tackles last season, so there is some early IDP appeal if this projected scenario sticks. Coyle (shoulder) was able to go through individual drills during Wednesday's practice, Matt Barrows of the Sacramento Bee reports. Analysis: Coyle underwent surgery to repair a torn labrum in January. He's just now starting to get back into the swing of things, but the expectation is that he'll be operating at full speed by the time training camp rolls around this summer. 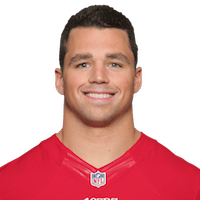 Coyle (shoulder) signed a three-year contract extension with the 49ers on Wednesday, Ian Rapoport of the NFL Network reports. 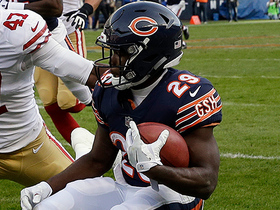 Analysis: Coyle is now set to remain in San Francisco through the 2020 season. The base value of his new contract is worth a maximum of $11.5 million with $4.1 million guaranteed. The four-year veteran remains unlikely to be ready for offseason workouts as he recovers from surgery to repair a torn labrum. Coyle (shoulder), who will become an unrestricted free agent March 14, is unlikely to be a full participant in any team's offseason program, Matt Barrows of The Sacramento Bee reports. Coyle sustained a torn labrum in his shoulder and underwent surgery Tuesday, Nick Wagoner of ESPN.com reports. Analysis: The expected recovery time is about five to six months, which would put Coyle's potential return in early summer, assuming he avoids any complications. The 27-year-old finished the 2017 season with 64 tackles (38 solo), one forced fumble and a half-sack. 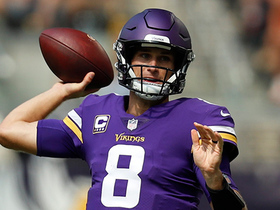 Minnesota Vikings QB Kirk Cousins rolls out to find wide receiver Stefon Diggs for an 18-yard reception. Los Angeles Rams running back Malcolm Brown takes off for a 20-yard gain. 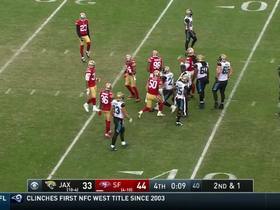 The Jacksonville Jaguars and San Francisco 49ers game is the first game in NFL history to end with a 44-33 final score. 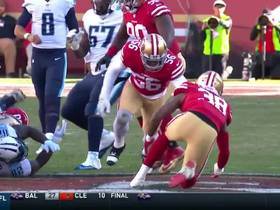 Tennessee Titans tight end Delanie Walker coughs up the football, 49ers recover. Chicago Bears running back Tarik Cohen takes the short pass from QB Mitch Trubisky and moves downfield fighting off defenders the whole way. 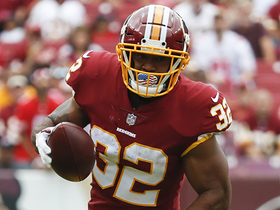 Washington Redskins running back Samaje Perine takes the pass from Kirk Cousins for a big gain down the sidelines. 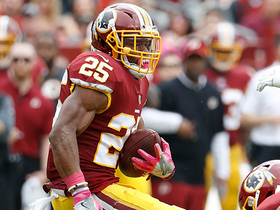 Washington Redskins running back Chris Thompson takes the short Kirk Cousins pass for a tough 20 yard gain. 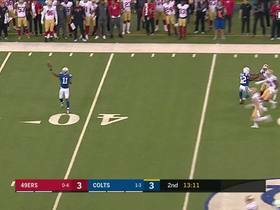 Indianapolis Colts wide receiver Krishawn Hogan attempts to lateral a pass on the punt return but loses yards on the play.